This week the RTÉ Guide are launching the RTÉ Guide/ Penguin Ireland Short Story Competition. The Winner gets published in the RTE Guide, plus 'special trophy and prize'. and 60 runners-up will also be invited to a special day-long writers’ workshop at Pearse Street Library in Dublin on September 7, which is organised in conjunction with Dublin, UNESCO City of Literature. No restriction on number of entries. 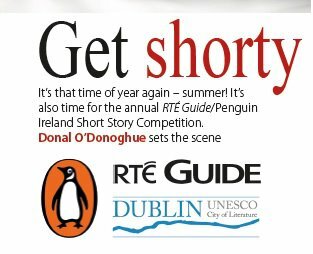 RTE Guide/Penguin Ireland Short Story Competition, Box 1480, RTE Guide, RTE, Donnybrook, Dublin 4. Is this an over 18+ thing or can kids enter too?? Are you also going to announce the winners of this competition on your blog?